Detroit-based Shinola is re-introducing its American Coin Dial Collection, a limited-edition run of 87 custom coin dial watches in three Shinola styles – the Runwell (top image), the Brakeman and the Birdy. 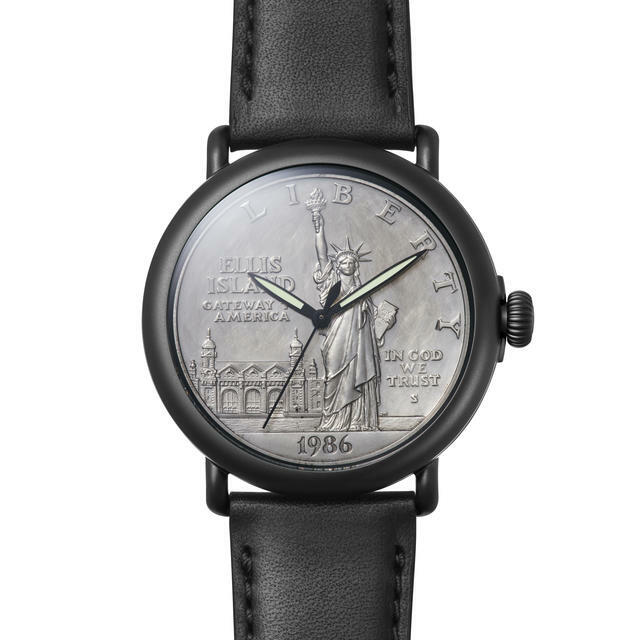 Designed to commemorate important moments of United States history, the timepieces use coins as dials. Coins used here include the Mount Rushmore Commemorative Coin, Fort McHenry Commemorative Coin and the Perry’s Victory Commemorative Coin, among others. 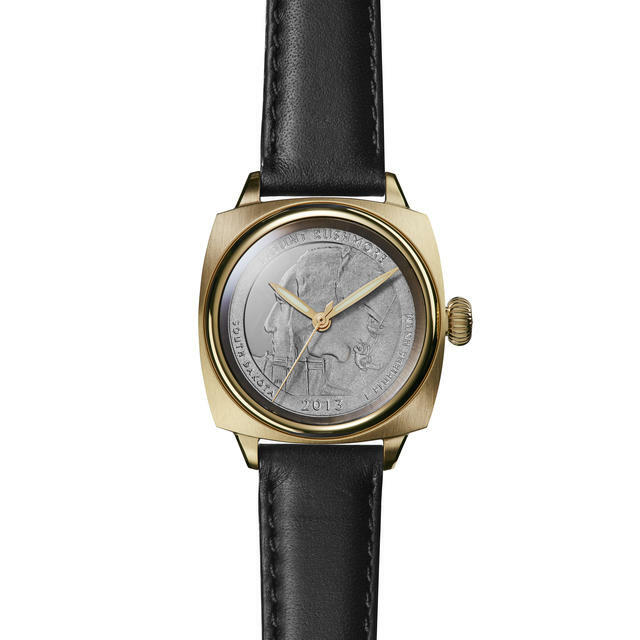 The Coin Dial Watches are $1,200 and available on https://www.Shinola.com. RGM founder and namesake Roland Murphy was recently inspired after he saw an unusual pocket watch on display at the NAWCC Watch and Clock museum in Columbia, Pennsylvania. Made by the American Watch Company in 1859, the enamel-dialed watch gave tribute to American Chess Master Paul Morphy, who received the watch from the Testimonial Committee of the New York Chess Club. RGM this year remade that dial for a limited edition collection of wristwatches, called Chess in Enamel. Instead of the usual Roman numerals on the dial, various chess pieces represent the hours and are finely done in red and black. 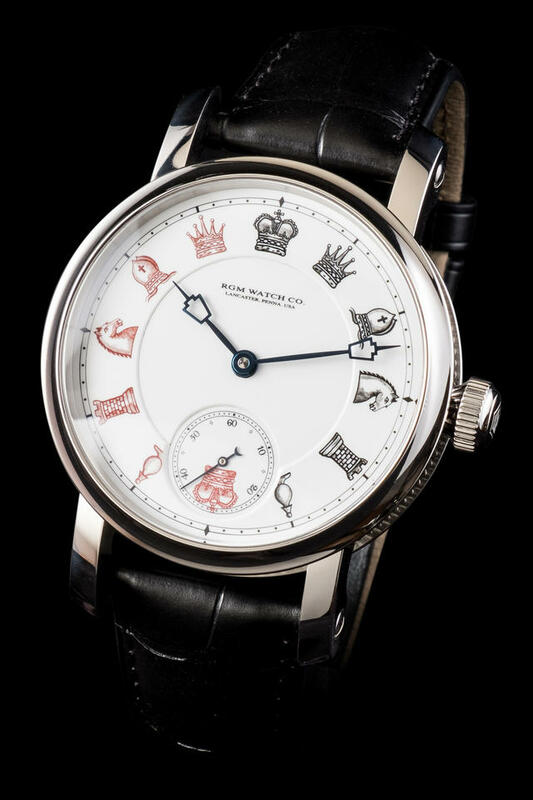 RGM chose to create an enamel dial with similar chess pieces indicating the hours. The 43.3mm steel-cased watch also marks the first time RGM has released a double-sunk Grand Feu enamel dial in one of its models. 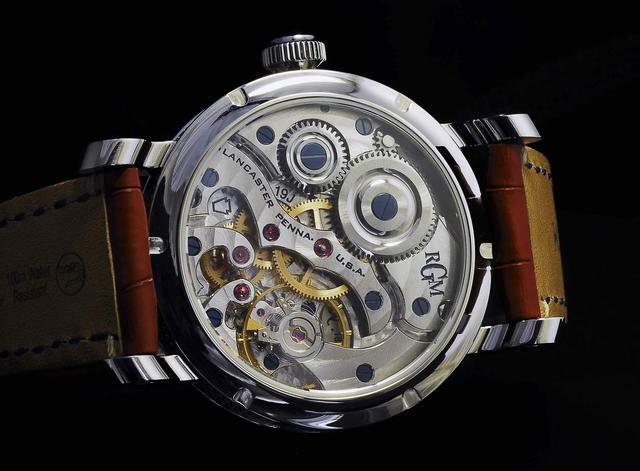 Inside it is RGM’s own American-made Caliber 801 manual-wind movement. 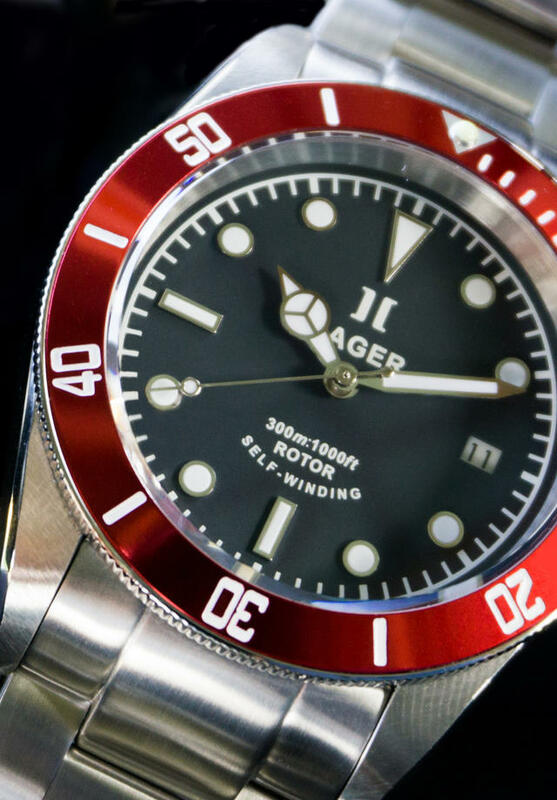 This Maryland-based maker of tough and affordable sporty watches now offers this stainless steel Aquamariner with a domed sapphire crystal, black dial, engraved steel unidirectional rotating bezel with a choice of black, midnight blue, or (our favorite) burgundy bezel insert. Inside the 300-meter water-resistant 41mm stainless steel case beats an automatic Miyota movement with a 42-hour power reserve. Other elements include slender, elongated beveled lugs with classic lines, and an anodized aluminum screw-down winding crown tube. The interchangeable bracelet and NATO strap also makes the watch highly versatile, and Hagar notes that the watch allows the wearer to adjust of the bracelet without using any tools. This allows it to be worn and comfortably over a diving suit. Price: $450 http://www.hagerwatches.com. Towson Watch Bay Pilot back view. Brew Watch Darkbrew HP-1 Automatic in black PVD. 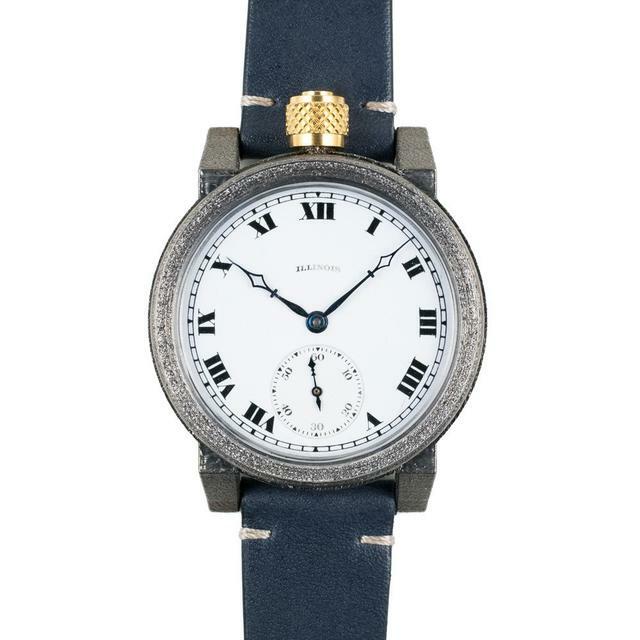 Detroit Watch Pontchartrain with blue dial. 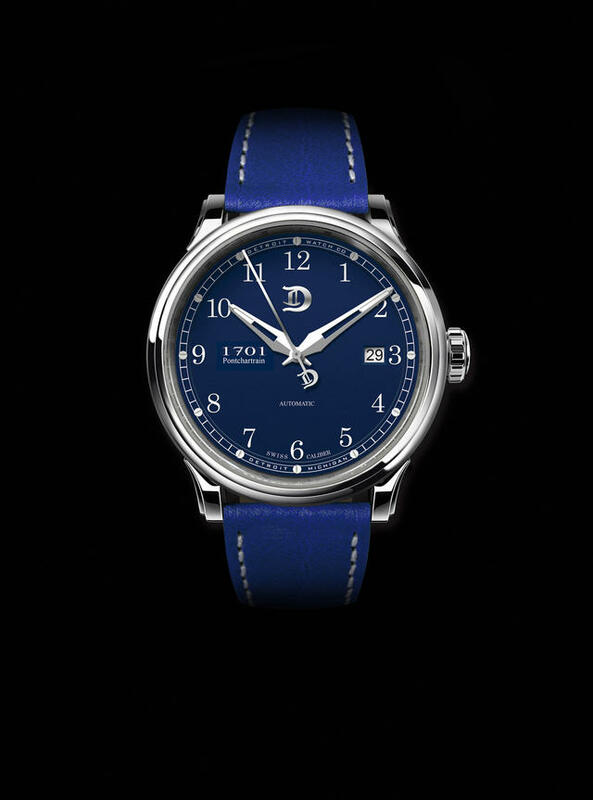 The Pontchartrain Blue timepiece at left honors the home city of the Detroit Watch Company, founded in 2013. The firm explains that the name is derived from Le Detroit, French for ‘the strait,’ which eventually came to identify Fort Pontchartrain du Détroit and the surrounding area. After 1751 the area became known simply as Fort Detroit. 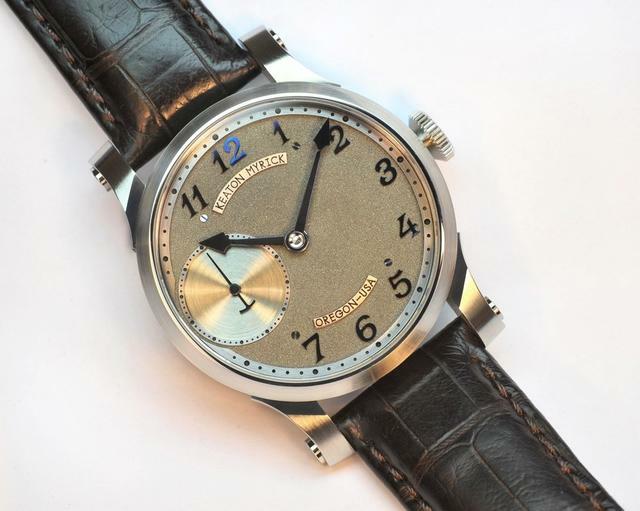 The watch’s 39mm polished steel case is fitted with an automatic Sellita SW200 movement with date window. The handsome blue dial features Arabic numerals and a stylized D logo on the dial and one end of the seconds hand, while the crown displays a black and silver Detroit Fleur-de-Lys. This St. Louis-based watch company fills a red-white and blue color scheme perfectly with its Fieldhouse Blue watch, a 40mm GMT model that displays a second timezone at the six o’clock position. This second time zone, in 24-hour format, is fully adjustable through the crown's core functionality. 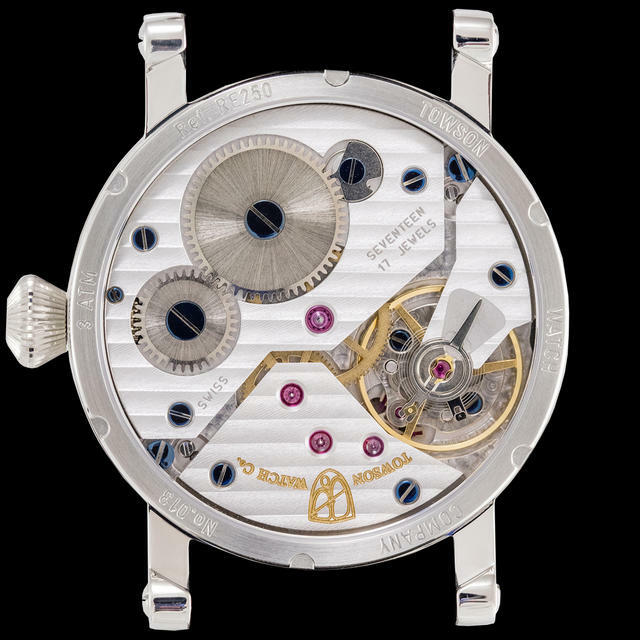 All this ability is powered by an automatic Eterna Caliber 39 series movement (with generous 65-hour power reserve) that Niall makes its own by adding its own rotor decoration and by adjusting a few other assembly functions. 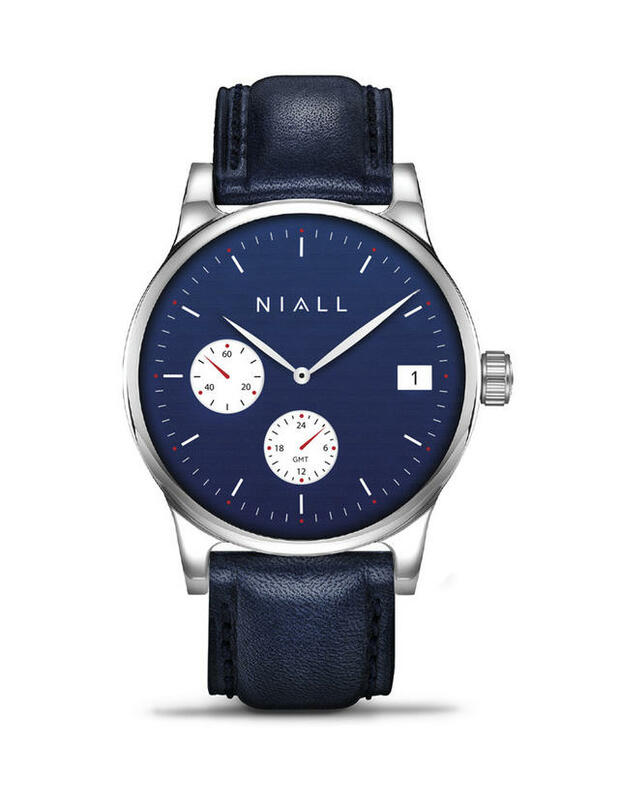 Niall also utilizes U.S.-sourced Corning Gorilla glass for all its crystals; Niall’s quick-change straps offer endless customizable options. Price: $4,450. See https://www.niallluxury.com. Los-Angeles-based Reactor watches has teamed up with famed marine life artist Robert Wyland to create a special limited edition watch that is the first from the brand to use an ionized multi-color effect on the case. 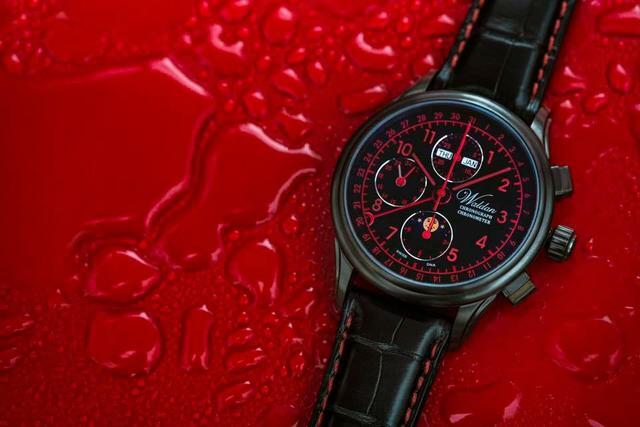 It may not quite be the red, white and blue of this week’s holiday, but this watch certainly is colorful. The watch utilizes Reactor's trademarked Never Dark system, which combines tritium illumination with SuperLuminova. The beefy 48mm case is 17mm thick, so this is a substantial timepiece on the wrist. Powered by the Miyota 9015 three-hand, 24-jewel automatic movement, the watch is a thousand-meter diver with a 4.5mm thick sapphire crystal. 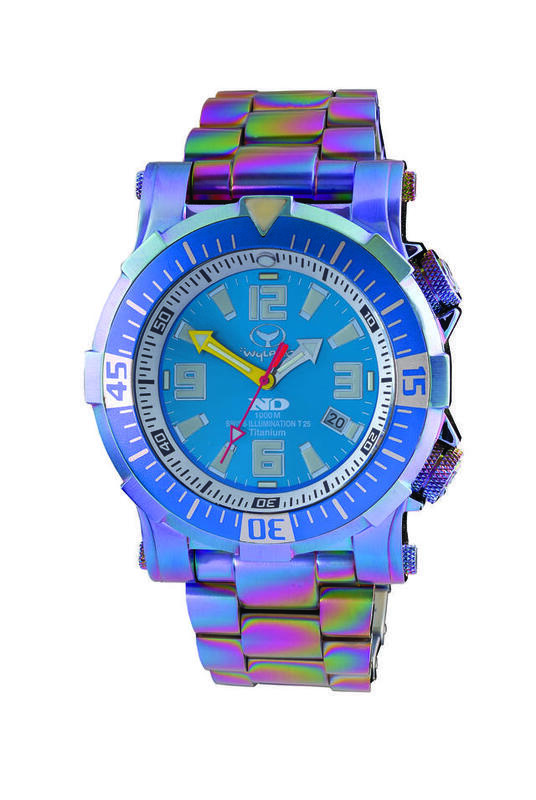 The watch comes with a signed, original mini-abstract watercolor painting from Wyland's coral reef color series. Only 225 pieces are being built. 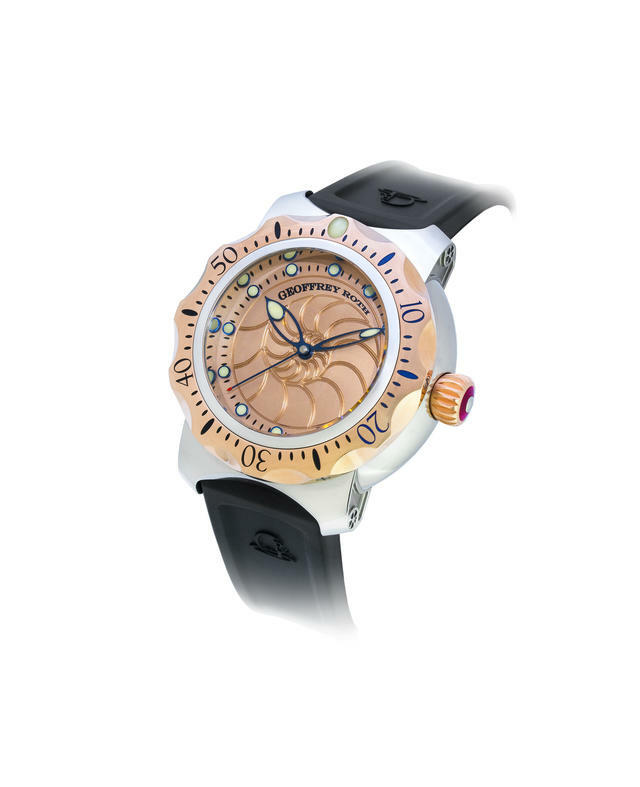 Find out more at http://www.reactorwatch.com or http://www.wylandstore.com. Price: $2,500. 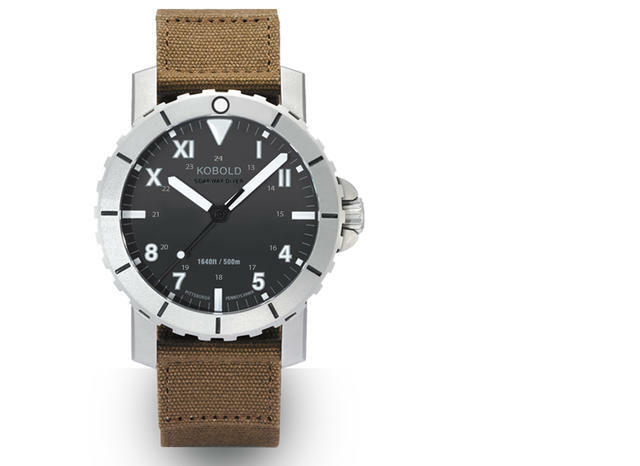 This family run, Ohio-based company builds watches for other well-known brands, but also offers a broad collection of quartz and automatic sporty watches. 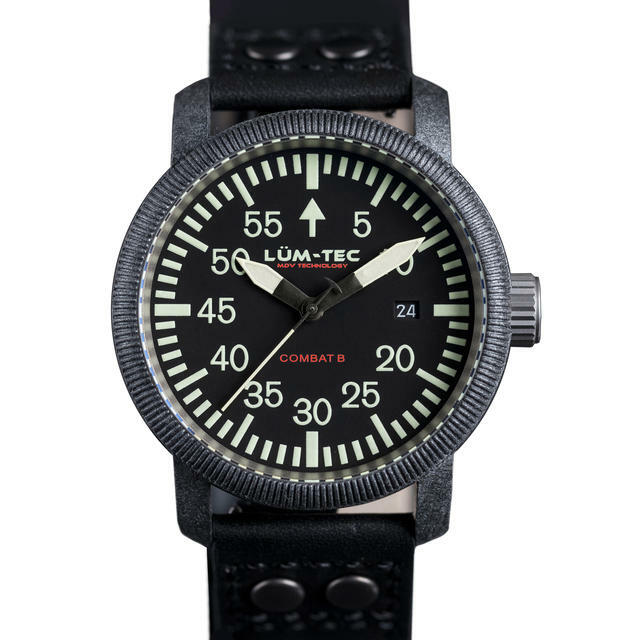 Per the company name, Lum-Tec specializes in its own hi-visibility luminescent treatments to numerals, hands and other dial markers. This Combat B24 Carbon is a 43mm model with a carbon composite case with a titanium core and caseback and 200 meters of water resistance. Inside is a Miyota automatic movement with hand winding and hack feature, topped with an extra-thick sapphire crystal. Price: $925. See https://www.lum-tec.com. Myrick makes his own handcrafted watches, using his own caliber, at his atelier in Oregon. He attended the Lititz Watch Technicum and then gained his WOSTEP certification, AWCI certification and LWT Diploma. 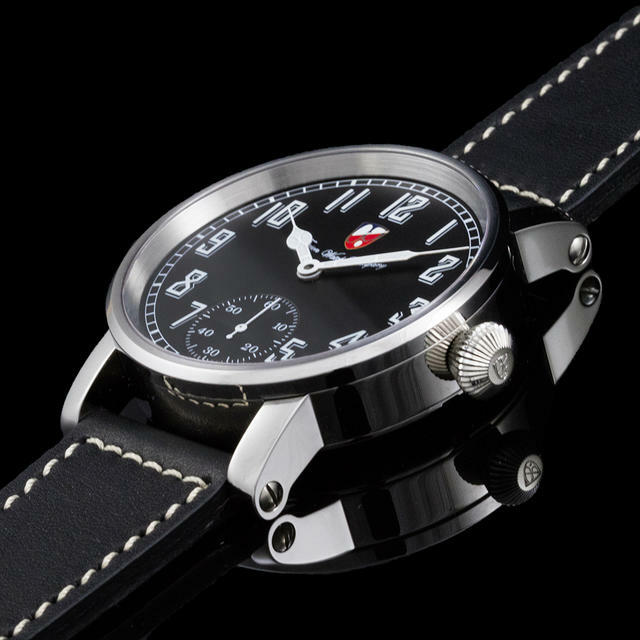 After he graduated, he worked at a Rolex USA service center, and today creates finely finished manual-wind watches called 1-in-30, a reference to the total number he will make of this design. With three-quarter plates and German silver dials, the watches recall the austere, frosted-finished styles seen at German watchmaking companies. He also repairs or restores high-end watches. See http://www.keatonmyrick.com.